However, from one viewpoint, these two axes only represent a partial picture. They look at the situation in two-dimensional terms, and as Rev. Moon points out on a number of occasions, including in the Divine Principle itself, the mode of existence of all created beings is three-dimensional, that is, spherical. The eight-stages paradigm (pal jeong shik) only deals with personal relationships (the vertical axis) and levels of magnitude of number (the horizontal axis; hereafter, “magnitude” is used in the sense of size or scale). The other axis that is missing here is time, and this is where lineage makes its appearance. I do not in any way mean to imply that Father’s description of the pal jeong shik is incomplete or insufficient. The pal jeong shik is a description of the course of the Christ (and all who follow) as an individual in the physical place (“Earth”), and an individual on Earth only exists in one lifetime. Hence, in terms of the pal jeong shik course, time as it exists beyond the individual is not quite relevant. Pal jeong shik is an illustration sufficient for its purpose. On the other hand, Father Moon also offers a description of the sphere and the seven-point paradigm. He describes how we define our position in the cosmos through the interaction of three axes: above and below, left and right, front and back. So while Newton conceived of time as an immutable constant, Einstein changed all of that with the general and special theories of relativity. Accordingly, while space involves three dimensions — height, width, depth — our universe also involves a fourth dimension, namely time. In short, lineage is a concept that relates to the dimension of time. Lineage describes a connection between elements existing in space from the perspective of time. Ancestors are those that came before us, and who are no longer here in the same place (physical plane). Descendants are those who will come after us, in the place we are now, but where we will no longer be when they are. Lineage actually describes a connection through time. It describes an extending scale of existence, not a scale related to space or the number of people (family, clan, ethnic group, nation, etc.) but a scale in terms of the extension of time. Conceive, if you will, of a lineage as a single entity stretching through time, like a river. As a member of that lineage, I am like a portion of a river. I may be at the origins of the river, or in the middle of the river’s course, or at the lower end of the river. Although my consciousness is focused on where I am in the river, I am a part of a greater whole. Likewise, a lineage has a life that started before I came into being in the physical world, and has a future that can potentially extend beyond the time I am present in the physical world. What comes before me affects me, because I am part of it. How I live and act and what I do will affect those who come after me because they are also a part of that same entity. This is lineage. 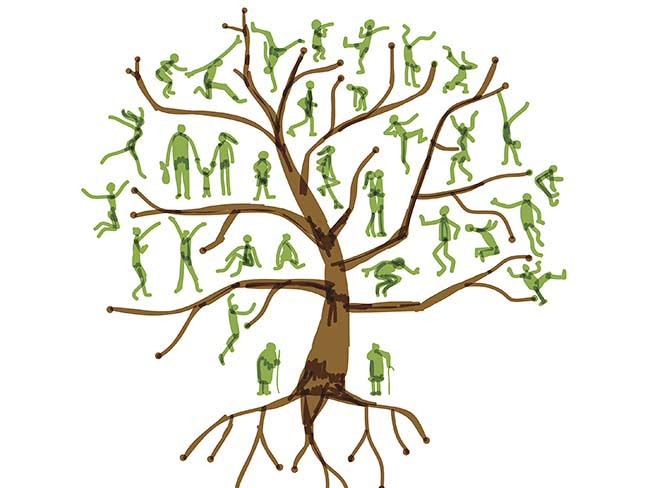 In this sense, just as individuals connected with each other form a family or a clan, so individuals and families connected through time form a lineage. This then is the third axis. Lineage is the flow of certain personalities, accomplishments and qualities through time. Likewise, when Satan accomplished control of Adam and Eve, he not only grasped control of the space they occupied as individuals, and not only expanded that control through magnitudes of population (akin to space), but he also achieved control over that space through time. The qualities that Satan infected the first family with expanded not only throughout space (via magnitudes of human interaction) but were also passed on through time. Rev. 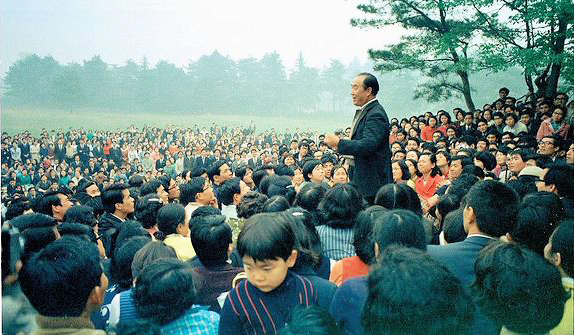 Sun Myung Moon speaking to followers in suburban Tokyo, Japan in 1969. The Christ thus comes not only to restore the vertical relationship with God (which is akin to penetrating deeper and deeper into the inner world of human existence — the “internal” axis), and not only to restore the horizontal dimensions of space (symbolized by the eight stages of horizontal magnitude), but the Christ also comes to restore the dimension of time, so that both the past and the future are returned to God. The presence of Satan’s lineage means the past and the present belong to Satan, to the extent that the lineage has influence. The establishment of God’s lineage means that the past is restored, and the future also restored, at least, in terms of potential. This is why preservation of lineage is so critical. Lineage represents the dimension of time. To resolve sin and accomplish unity over time, all Unificationists should realize we do not exist merely for ourselves. Moreover, we do not exist merely for the family, clan, nation, and world of which we are a part today. We also exist as part of the past, and part of the future. From this perspective, lineage is a fusion of the qualities of human relationship passing through time. Quality of relationship (the vertical eight-stage axis) is both internal to the horizontal axis of magnitude (i.e., a nation may be an enemy, or a servant, or a child, or a bride of God, for example), and at the same time internal to the other horizontal axis of time (i.e., a lineage may be in a position of an enemy to God, or the position of an adopted child or true child of God, for example). 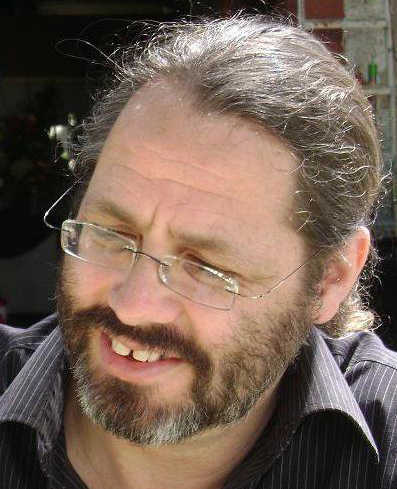 Andrew Lausberg is a linguist and translator with extensive experience in Korean, Japanese and Australian culture. He lives with his wife, Shizue, and four children in Melbourne, Australia. Andrew and Shizue are part of the 6,516 couples (1988) and served as National Leaders of Vanuatu during the mid-2000s. A fine metaphysical meditation. Thank you. I like the geometrical image created here. In the West, spirituality is often treated as an individual, personal quest, rather than as part of a connected fabric. Many Unificationists view their life course as a series of simple binary relationships: Cain/Abel, good/evil, husband/wife, parent/child. This construct creates a context for those relationships as building blocks for a larger, meaningful existance. Good on ya, Andy! Wish I’d said that. Excellent article and satisfyingly clear. Thank you, Andy. Just one point: as a daughter, I cannot fully emulate Father Moon. I thus strive to emulate Mother Moon. I believe that the idea of lineage is a much-misused concept among many Unificationists. It can often be seen as “my” lineage or “your” lineage, which simply serves as a way of thinking of us as separate from one another. There is, of course, only one lineage and that is that we are all part of one family under God. Another way to think of lineage is that it relates to our identity as a beloved child of God. I appreciate Andrew’s understanding of lineage connecting us all through time and that we are all a part of this flow of time and as such we owe much to those who went before us and that we have a responsibility to those who come after us. Not least to leave behind a sustainable planet for them to live on. Very good article. Lineage also involves (perhaps essentially) blood lineage. How does one change blood lineage? I doubt whether the whole process can be revealed to the uninitiated. Part of it seems to involve knowing fully what transpired at the fall. The other is what role did Rev. Moon and his wife have in rebirth and restoration? This is an excellent article. Lineage is a concept almost disregarded in the West and it needs to be clarified. My concern is how to explain these concepts to psychologists and social scientists. I think it is important to point out that “unconscious” or “subconscious” thoughts and patterns are transmitted non-rationally to people and determine a large part of their character and disposition. This aspect of one’s inheritance from the past is more influential than rationally-transmitted knowledge, and thus more important to whether inherited sin will have a claim on the individual. In terms of conscious development, it is necessary to eventually transcend the self, family, clan, ethnic group, nation-state, and world as absolute loyalties and see the world “from God’s point of view.” Group self-centeredness is the basis of racism, theft and war. We inherit these dispositions from, for example, cultural leaders like preachers who claim that their way is the only way to salvation, political party leaders who claim a right to take money from members of other parties, a cultural group that fails to tolerate other groups or commits genocide, or state presidents that argue national self-interest is the end game. Lewis asks about “blood lineage,” and here we get into the nature vs. nurture discussions which can get very heated. Certainly, in the case of human beings, nurture is a much larger percentage for the development of a human, whose brain develops for many years after birth, than a guppy, whose brain is fully developed at birth.